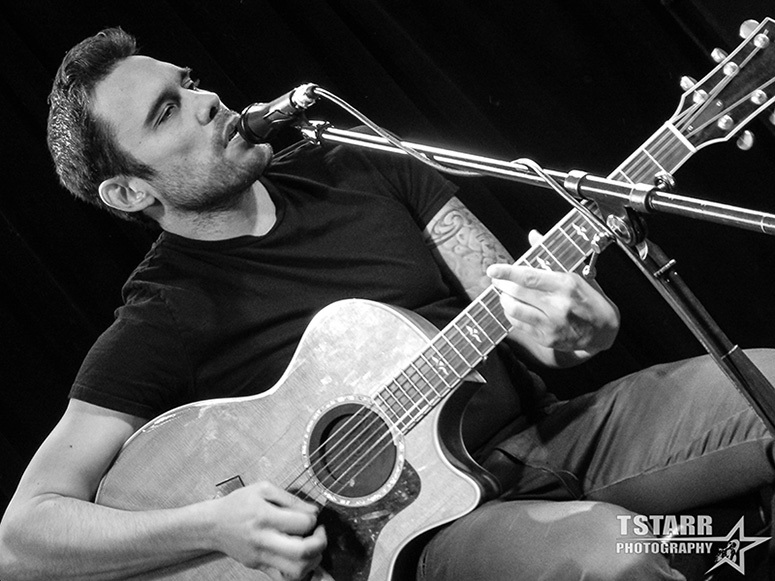 Chris Taylor Brown, Vocalist from California -based Trapt, is currently on tour doing an all-acoustic set list. Drum box backed and stripped down vocals and acoustic guitar, the sting of fan favorites are still felt through his playing. Songs like “Black Rose”, “These Walls” and “Too Close” still carried the original tracks’ emotions. “Headstrong”, “Echo” and the night closer, “Who’s Going Home with You Tonight” had evolved into a more soulful version than the original. Also on this leg of the tour, his brother, Eric Brown, and his street musician meets Jim Morrison meets Curt Cobain, also put on a great show last night. To open, hometown boys (and girl) Ultrea, opened the night with an eerie acoustic rendition of their normally heavy driven set. Last night I had the experience to chat with Chris before hitting the stage at The Annex at the Red Zone in Madison. Maximum Ink: You’re now on tour highlighting your acoustic set. How was the transition from your heavy driven material to the more stripped down version? Chris Taylor Brown: Yeah, we’re doing just vocals, acoustic guitar and percussion, breaking down the songs; the essence of what they are. We picked songs that started out on acoustic guitar, and really showing the fans how a song needs to sound when you write it, to take it to the next level, and make it a full band, electric thing. It’s gotta be something you can play around the campfire. And still be good. The transition was easy. Natural. MI: There’s a ton of new music out. Anything catch your ear? CTB: Well, I’m getting into country a little bit more. Like that small town boy sound. I like the songwriting that’s going on in today’s country stuff. It’s really good songwriting, catchy and energetic. Almost like rock, as far as the pace of the songs. MI: Outside of music, what inspires your creative side, for writing? CTB: Relationships. What inspires the most emotion in me, would be, relationships, romantic relationships. That’s probably where a lot of my songs are kind of pertaining to. But, there’s also a lot of relationships with yourself, as far as how you hold yourself back because of fear. It’s more of trying to get rid of that fear, and push ahead. And it’s the way I see people allowing fear to kind of limit them. Everyone has fear; it’s how much do you listen to it. Even a schizophrenic person has a point to a degree, that we should be afraid of certain things. But it’s how much you listen to that, is the difference. MI: What do you feel changed in the music industry since the inception of Trapt? CTB: Social media and the internet. You really have to rise above a lot of the other stuff that’s going on out there if you want to be heard because anyone can release their music now. So I think you have to be better to illicit a major response in a lot of people to their music. Or even keep the ones you already have. There’s so much good stuff coming out, well, not sure if all of it’s good. There’s just so much music coming out. So, I think in the 80’s and 90’s a lot of stuff that was being pushed by the labels, that was crap, and the stuff that was really good, people discovered it, but even if it was really good, nobody would know about it unless it was on the radio or MTV or something like that. These days you can make a great song or album and just throw it up on YouTube or something. If it’s good enough, people will share it, and it’ll get big. The weekend is a perfect example. It just came out independently, had a bunch of great songs he put out, and it was just YouTube. MI: What was the first show you went to? CTB: The Grateful Dead. I was, I guess 12. My dad took me. I don’t really get the Grateful Dead too much, nothing too exciting. My dad liked them, but the show we went to wasn’t their best, but that’s what he said was great about them. You never knew what they were going to pull out, sometimes they would be too drunk or too stoned or too whatever, and they wouldn’t play too great. And other times they would be on fire. I like a few of their songs, but I don’t think they’re amazing, like Led Zeppelin or something.